The image I tweeted from early on at the Avondale Forest Protest walk on 28 April 2013 against the governments proposed sale of Ireland’s public forests. I’m just putting this post together to record what happened at Avondale a few weeks ago that has helped grow the public opposition about the proposed sale of Ireland’s public forests. 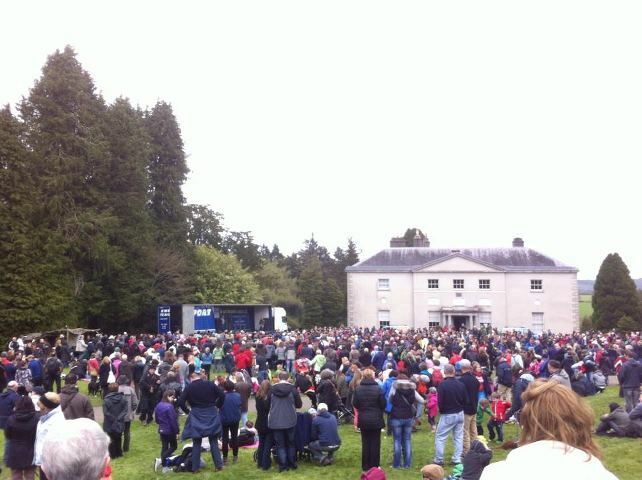 It was incredible to be part of roughly 4000 people, to turn up at Avondale, Co. Wicklow to take part in a public walk in the forests there. I went with a few friends and other Green Party members. Above is the image I tweeted early on at the event, and the video below sums up the mood of the protest. Last Friday, I made this press statement, as spokesperson for the Green Party on Forest policy. While there has been much outcry from various sectors about the error of selling a national public asset, not many have seen that we need to rethink of our forests future. The state through public funding has established 11% forest cover in a relatively short few decades, but the types of forests planted and how they are managed need serious attention. Ireland’s new young forests are already valued as an amenity with over 18 million visits per year, but as we had no forest culture for so long, we are only learning that what grows fast for quick profits has costs. The dominant type of forest planted with our current government policy have been monoculture industrial conifer plantations and more recently broadleaf plantations. They offer a poor future with diminishing productivity returns, they are poor in biodiversity, costly to replant and are also extremely vulnerable to potential diseases and insect attack that are increasingly likely with climate changes. We need instead to introduce and support permanent, non clearfell forestry that provides ever increasing ecological and economic returns with improved amenity values. The large public demonstration has obviously got the government’s attention and yesterday there was another report from the Oireachtas committee on Agriculture also adding to other reports, that the amenity and social costs have not been factored into the sale either. The debate was discussed here on the Vincent Brown TV programme a few days ago too.